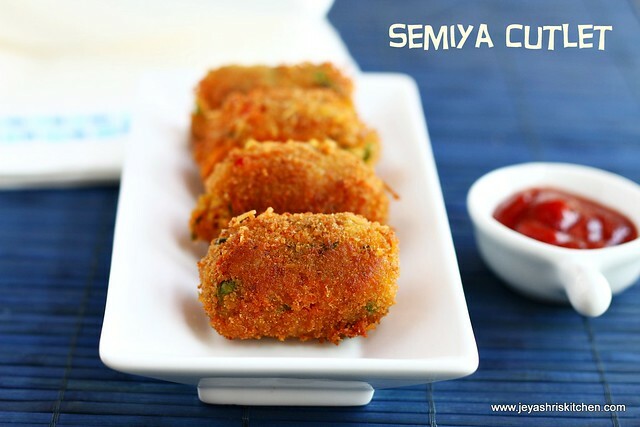 Semiya cutlet, is an interesting snack recipe, which kids will enjoy .It is similar to vegetable cutlet recipe but the addition of semiya makes it more yummy and crispy too. I tried this semiya cutlet for kids last week, and they both thoroughly enjoyed it. 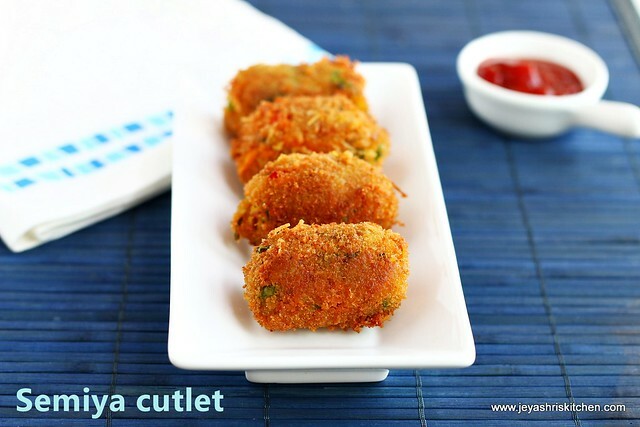 This cutlet is a perfect starter recipe and will be super hit in parties too. Try out this and let me know how it turned out. share your tried recipe with pictures and i will publish in Jeyashri's Kitchen facebook page. Dry roast he semiya for 5 minutes in a low flame till it is golden brown. Add 1 cup water to this and cook it till soft and all the water gets absorbed. Boil the potatoes and grate them. Grate the carrots. In a wide bowl add the carrots, grated potato and cooked and mashed green peas. Add the garam masala, jeera powder , red chili powder, coriander leaves and salt. 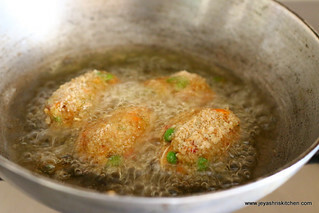 Add in the cooked semiya and mix well into a thick mixture. Mix the all purpose flour in water. Let this be diluted and not thick. Take small portions from this and make a desired shape on your own, Dip this in the maida water mix . Roll the min the bread crumbs. I dry roasted 1/2 cup of semiya and coarsely powdered it and rolled half of the cutlets in the semiya. Since it was over, the remaining i rolled in bread crumbs. Cover this with a cling wrap and keep it in the refrigerator for 30 minutes. This is just to make the mixture firm. You can skip this and go ahead for frying. Heat oil for frying, when it becomes hot, keep the flame to medium and deep fry this in oil . Add in batches , do not over crowd the pan. Drain excess oil in a kitchen towel. Serve hot with tomato ketchup. If you have left over semiya upma you can make this too. In that case add the boiled potato and mash it nicely with the upma mixture. While adding the semiya ensure all the water is completely absorbed. In any case if the mixture is slightly wet, add 1-2 tblsp of maida flour to this and mix well. Great snack with semiya.. 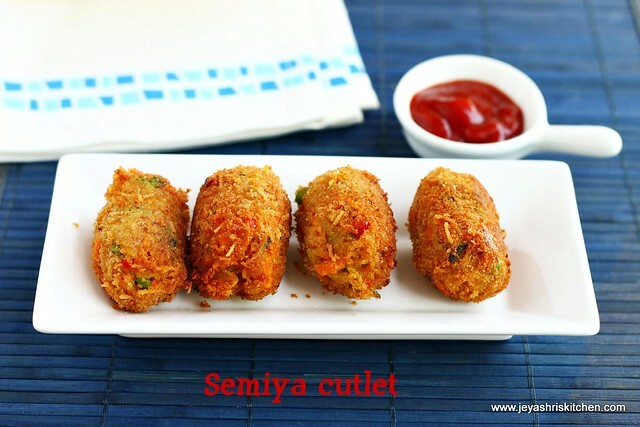 So tempting..
semiya cutlets look so tempting and crunchy. How much quantity of all purpose flour to mix in water? What is a cling wrap? How long will this stay crispy? Can I make a day ahead of when I need it, will it reheat well?